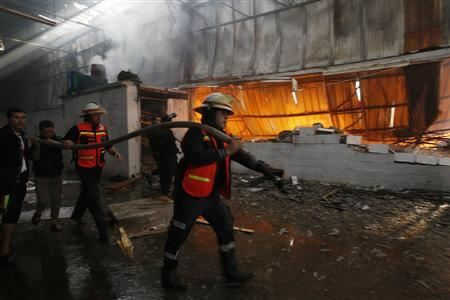 Firefighters try to extinguish a fire at a factory, which according to Palestinians allegedly was hit by an Israeli air strike in Gaza. GAZA (Reuters) – Egypt tried to open a tiny window to emergency peace diplomacy in Gaza on Friday, but hopes for even a brief ceasefire while its prime minister was inside the bombarded enclave to talk to leaders of the Islamist Hamas movement were immediately dashed. A Palestinian official close to Egypt’s mediators told Reuters Kandil’s visit “was the beginning of a process to explore the possibility of reaching a truce. It is early to speak of any details or of how things will evolve”. Israel undertook to cease fire during the visit if Hamas did too. But it said rockets fired from Gaza hit several sites in southern Israel as he was in the enclave and has begun drafting 16,000 reserve troops, a possible precursor to invasion. Tanks and self-propelled guns were seen near the border area of Friday and sirens sounded again over Tel Aviv, after witnesses in Gaza saw a long-range rocket launched. Israeli police said it landed in the sea off Israel’s commercial centre. A Hamas source said the Israeli air force launched an attack on the house of Hamas’s commander for southern Gaza which resulted in the death of two civilians, one a child. Israel’s military strongly denied carrying out any attack from the time Kandil entered Gaza, and accused Hamas of violating the three-hour deal. “Even though about 50 rockets have fallen in Israel over the past two hours, we chose not to attack in Gaza due to the visit of the Egyptian prime minister. Hamas is lying and reporting otherwise,” the army said in a Twitter message. The statement is completely true. I have always believed and continue to do so: that Israel has a right to protect themselves from those who would kill them, and steal their land, which was given to them by God. Many news media are a fan of displaying the children of Palestinans who have died. Such a thing is horrendous, but never hardly do we see those that were killed in Israel. And these children would still be alive today, if Hamas ceased firing rockets. It is the truth. Hamas is a violent organization who will only back down when Jesus our King comes, and destory all those against Israel. The time has come to repent of your hatred, against Israel. For those against Israel, are against Christ our King. The hour is near and HE comes soon!